Are you contemplating on whether your business should go solar or not? Hold onto that thought! It might be the best decision you have made yet for your enterprise. Solar energy for business is becoming very popular. In the recent past, more businesses prefer to go solar. 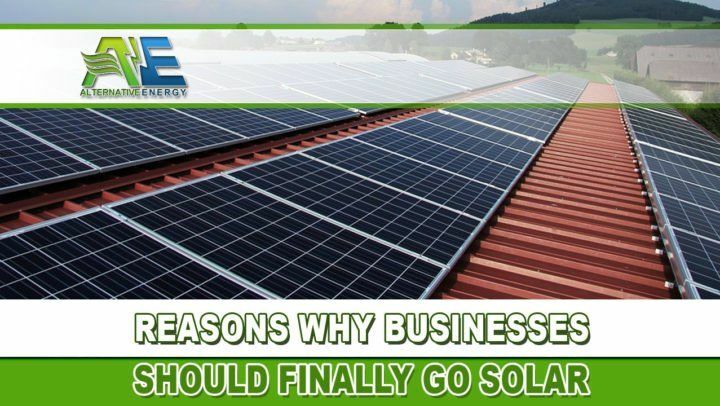 Using solar panels to generate electricity to run a business is a win-win situation because it will eventually contribute to the real reduction of expenses as well as play a role in the conserving the environment by reduction of the company’s carbon footprint. A business’ decision to go solar is both a “gain and give” situation. The accumulative cost of purchasing and installing the solar panels has significantly reduced over the years while there is electricity charges skyrocket. A business choosing to go solar finally is not an expense; rather it is a lifetime investment for the enterprise. Using to use solar panels for commercial purposes can deliver long term returns for the company. Installation of solar panels means that a business will cut on the electricity expenses and the cash can be diverted into other business use. Also, a company that goes solar stands to create incremental revenue which will be an extra source of income for the firm. The price of electricity is highly unstable, and the companies are unable to make appropriate predictions of the amount they are likely to spend. The cost of electricity is subject to an annual compound growth rate. A business that makes a move to go solar can generate their own electricity to run the business operations efficiently. This implies that the firm will not be affected by the unpredictable electricity charges. Thus, if your business goes solar, you will be in a better position to accurately plan for the monthly expenditure of the firm without the worry of having an unplanned expense. The moment your business goes solar, your carbon footprint decreases. In the United States, buildings contribute to 39% of carbon emissions. When a company uses solar as the source of energy, there is a reduction of electricity from your business’s utility. Therefore, there is less carbon emitted while producing the power to meet the commercial need. While your decision to go solar creates a dent in the level of pollution, the cumulative impact of businesses embracing solar all over the country is what will eventually lead to a long lasting impact on the environment. Some of the essential components of any organization’s culture are corporate social responsibility and sustainability of the business. They also play a significant part in producing bottom line results. Businesses have noted that ‘green’ certifications are a potential driver of influencing a client’s decision to trade with the firm, create good will and improve the general output of the business. Potential customers will go for a company that demonstrates dedication to sustainability. Buyer prefers products and services that are solar powered. The community is biased towards organizations that are operating responsibly and your business is going solar is a great way choice of marketing. More companies are becoming aware of the economic benefits as well as the social benefits that follow after installation of the solar panels. The businesses that decided to solar early are proving to be more competitive than the companies that are yet to adopt the use of solar energy. The latter are now exploring the use of solar energy so that they are at par with the competitors in the same industry. For a business that goes solar, there are rewarding incentives that are offered by the government. The federal, local and state government ensures that any company that uses solar energy is rewarded for the solar conversion. The federal government in the United States fully supports the use of solar energy which is clean and renewable through Section 48 Investment Tax Credit, the tax depreciation program, Modified Accelerated Cost Recovery System and Section 1603 Treasury Grant Program. Employees appreciate and prefer to be associated with an employer or business that is committed towards sustainability as well as demonstrates their desire for corporate social responsibility. The employees are part of the success of a business and the general contribution of the business to the larger community. Companies that are concerned about the impact of the operations to the community and the environment have registered a low turnover rate of employees, motivated employees and the morale a t work is considerably high. The final beneficiary of highly motivated employees is the business as there will be high output. A company that goes solar impacts positively on the economy of the country. The industry of solar energy continues to provide modest jobs in the country. Research by The Solar Foundations 1.2% of all the new employment opportunities in the United States was created by the growing solar energy industry. The solar energy continues to offer better opportunities for low and middle skilled employees with their wages significantly high. What is the Future of Solar Energy for Businesses? Signs point to the solar energy becoming a more preferred source of energy for any business. The costs of solar energy, the availability of solar panels and the benefits that accrue to any business the goes solar will continue to see more enterprises adopting the solar energy. The brilliant move by more businesses to go solar will contribute to the independence of the United Stated as there will be no need to outsource energy and the environment will well-taken care off. If you would like to explore how much solar power for business can save your company in Arizona, Texas or Florida; get in touch with Alternative Energy, LLC today by giving us a call at (480) 744-1803. Our Commercial solar contractors can get you financed with no money down and lower monthly payments than you are currently paying. Don’t pay another $1,500 electric bill ever again by choosing solar power for business today.